New release focuses on 'collaborative performance management' and improved analytics. 8x8 today introduced advanced quality management tools and new analytics capabilities for its cloud contact center solution, Virtual Contact Center. 8x8 has attached the marketing tagline "collaborative performance management" to the QM 3.5 release -- and several new features support that characterization. The "sexiest" one among them is the ability to type an @mention in an interaction recording to add an annotation and share the media file with others in the business. For example, imagine a contact center supervisor or QM manager reviewing an audio recording and screen file of an agent who has done a particularly great job of upselling a customer after a simple inquiry call. By typing @SalesTeam, for example, the reviewer not only would be able to forward the file, but also mark the location so others are pointed directly to the relevant section of the interaction. Or, the reviewer could snip and share just a section of the recording. A media player would come embedded with the recording -- a capability not available with legacy QM solutions. In this example, the company's @SalesTeam distribution could include agent peers as well as marketing or product managers so they could get a sense of what is working (or alternatively, what isn't working) with customer engagements. Apropos of having a full UCaaS and CCaaS portfolio, 8x8 is adding value in the contact center that crosses the enterprise as well. In addition to its collaborative benefits, the use of the @mention feature can help speed agent competency and onboarding -- so key to contact centers where staff turnaround is such an ongoing issue. Imagine that instead of having new agents sit through training sessions, a supervisor could use the @mention feature to push out examples of how other agents have successfully handled common transactions or tricky issues. The @mention feature helps create a new approach to training, one that is more in tune with the millennials who are such a large part of the contact center workforce, Tim Richter, 8x8 director of product marketing, said during a briefing. For them, learning is not a rote process. Instead of an interaction review that just says, "You didn't do a good job of upselling on this call," an agent gets a link to a call with great upsell. That's collaborative not punitive -- which works for all of us, not just the millennials. As for the new analytics capabilities, 8x8 also announced VCC Post Call Survey and VCC Customer Experience features. 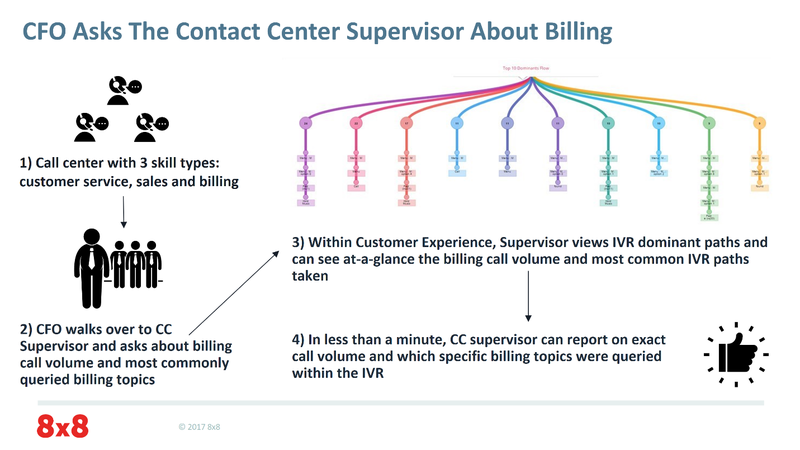 With the latter, a contact center supervisor will be able to create a graphical view of customer call flow, including a visualization of popular IVR paths. The value of this capability is best explained via example, as seen above. The example emphasizes that because of the importance companies are placing on customer experience, contact center managers need the ability to create reports on call volumes not only for their own use but for CMOs, CIOs, and CFOs who are watching customer care metrics as well. As these latest offerings show, 8x8 not only is looking to continue helping businesses make better use of the information gleaned from their contact centers, but also to reinvigorate processes for the management and training of staff within those contact centers.